Achilles Tendonitis is very common in running and sports that involve running and jumping. Activities such as babmington, squash, tennis and basketball where jumping is involved will all get their share of achilles tendon injuries. The achilles tendon is located just below your calf muscle and attaches into your heel bone. It allows you to rise up on tip toes and push off when trying to move forward. It carries the weight of the whole of your body when running and therefore needs to be very strong. Overuse injuries can occur when running extended distances or running up hills which puts more stretch on the tendon. On occasions the achilles tendon can rupture and snap, which is very serious for an athlete. Surgery is then required to join the tendon back together, but there will always be a weakness and top flight sport is generally ruled out. 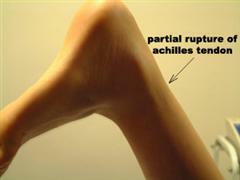 Achilles tendon injury can be an inflamed tendon or tendon sheath which can thicken. The tendon itself can develop a lump on it which indicates it has been damaged and a repair is in progress. Squeezing the lump is painful and running will irritate it further. Achilles Tendonitis treatment is varied but the most important thing is to treat both symptoms and cause. Treatment has to be reduce pain and swelling and condition the tendon to be able to function without pain again. Electrotherapy such as ultrasound and interferential are useful in speeding up recovery time. Atlas sports physiotherapists are experienced in treating achilles tendonitis and can get you back running again. 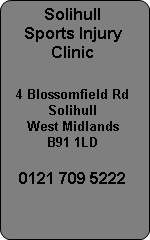 Solihull Sports Injury Clinic has experience at treating Achilles Tendonitis and injured achilles tendons. Our sports injury physiotherapists and sports therapists can get you back running in the fastest possible time. Many achilles tendon problems are chronic by the time we see them because people try rest and manage the condition themselves without success. Visit the sports injury specialists at Atlas and get advice and treatment on this troublesome condition.